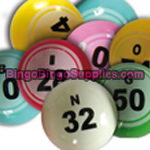 Need bingo balls for your new machine or cage? At Bingo Bingo Supplies we sell everything you need to run a successful bingo night, from bingo tickets and machines to dabbers and other accessories. We have replacement balls for sale at competitive prices, in two sizes that are suitable for the majority of traditional bingo machines and cages available both here and elsewhere. Our standard size balls are 22mm in diameter and come in a set of 90 balls, as commonly played in the UK. 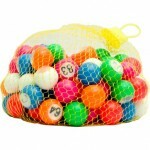 Priced from only Â£10, these high quality balls are perfect for playing from a bag or bingo cage. The giant balls, designed for larger cages, are 38mm in diameter and start from only Â£20 for a set of 90. We also stock checkboards for placing the balls once drawn, with options for both the standard and giant size balls we sell. Shop with confidence with Bingo Bingo Supplies, leading UK suppliers of bingo equipment and accessories since 2003. You can purchase online from our secure website, or you prefer we can take orders over the phone. For any questions regarding the products we sell or specific order requirements feel free to contact us on 01707 655 189.